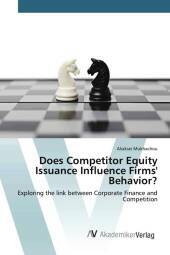 Does Competitor Equity Issuance Influence Firms´ Behavior? Financing and investment polices of different companies are interlinked through various channels. One of these channels is product market competition, which can make outlier events of equity issuance of a competitor change the policies of a firm. We develop an investment project portfolio model of competition and study a sample of US companies to find that such companies tend to deleverage, underinvest and amass cash - much as we would expect from a firm experiencing an increase in product market competition. Weak competitive position, certain characteristics of the business model, higher operating and financial risk and increased research coverage can strengthen this effect. The choices that the company makes in response closely interrelate and may give an idea of the future returns and performance. Aliaksei Mukhachou is a Master of Arts in Banking and Finance graduate from the University of St. Gallen, Switzerland. Current HOLT Equities Analyst at Credit Suisse in London, UK.